the projection booth: Introducing- A Field Guide to Invertebrates in Film: Them! Introducing- A Field Guide to Invertebrates in Film: Them! Just so you know I’m one bug-crazy gal. While the internet is full of movie lists, I’ve found that my particular niche is less represented than I’d like. 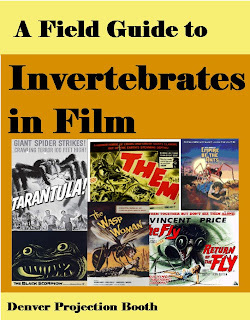 So here goes, A Field Guide to Invertebrates in Film: a weekly series about bug movies for the invertebrate-inclined. Just to satisfy my geeky need for proper terminology, I have to tell you that spiders, worms, snails, crabs, crayfish and centipedes are not insects, nor are ants, bees, wasps or grasshoppers truly bugs. Still, this little projection booth series will be devoted to all of the things you less entomologically-inclined folks might call bugs that show up in movies. Bug movies come in all shapes and sizes, but rarely do they hit grades above B. 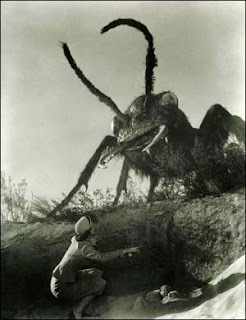 Some movie bugs are nature’s revenge for human misdeeds and some are evil critters from other worlds. We also have bugs which are the result of mad scientists overstepping the bounds of good taste or used as tools for clever murderers. Just as an aside, when I say movies, I must confess that I have no intention of ever covering kid’s movies or lame comedies with bug themes. I’m going to stick to the underbelly of the movie world: sci-fi, horror, giallo and the like. I just feel more at home there. Modus Operandi: Bites victims with huge mandibles, fills wound with formic acid. Work in groups. End Goal: To overtake the Earth as the dominant species, of course! The other voice of science in this film comes from another sometime staple of 50s sci-fi: the smart, but hot lady scientist, Dr. Patricia Medford (Joan Weldon). Although her first introduction to us is via her legs, Pat is the crack entomologist on the case, second only to her father, the world famous myrmecologist. She’s feisty and smart, snapping “Look, Bob. There’s no time to give you a fast course in insect pathology. So, let’s stop all the talk and get on with it.” in response to the G-man’s attempt to shelter her “or any other woman” from danger. This snappy dialogue is one of the strengths of Them!. While other 50’s sci-fi films drag, Them! moves along at a clip, with science, humor and tension delivered smartly enough to keep even today’s jaded audience engaged. Saving the best for last, there are the ants. Atomic extra-largeness aside, Them! expended more effort than most to have a plausible scientific grounding. They even provide a short primer on ant morphology and behavior, for those of you who didn’t already know that ant queens lose their wings after mating and other fun facts. Using giant mechanical models, rather than stop-motion animation or green-screen live shots, the ants in Them! are larger-than-life-sized horrors that must have scared the pants off of your average movie-goer in the 50s. Perhaps their wobbly movements look a bit silly to us now, but the level of detail: full-body shots, textured exoskeletons, shiny, multi-faceted eyes and real-time interaction with actors, lend the ants in Them! a credibility not seen in the many subsequent films that tried to cash in on its success. Nit-picking Science: Stinger, Dr. Medford? Carpenter ants don’t sting. They bite and then spray the open wound with formic acid.